(BPT) – A holiday party is a wonderful way to celebrate the season with friends and family. However, no matter how big or small the guest list, hosting the event can turn stressful fast. Before you know it, your holiday gathering has become more frustrating than festive, and you’re suddenly feeling like a Scrooge. Opt for potluck: The holidays are all about coming together and helping others, so this year instead of tackling a multi-course meal, set up the buffet table and invite guests over for a potluck. You provide the appetizer and main course and allow guests to bring over their favorite holiday recipes to share. 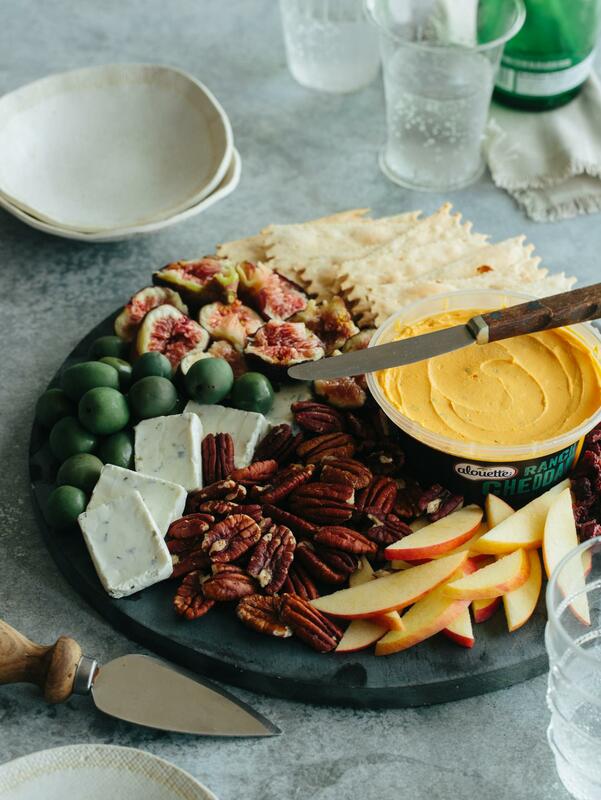 Amazing appetizers: Set out apps that are easy on the host but don’t compromise taste, such as cheese spreads with a crudite plate and a variety of chips or flat breads. Try the new Alouette Sharp Cheddar spread on a crostini topped with thinly sliced prosciutto. If you want to be a little more adventurous, swap in either the Chipotle or Ranch variety for an extra kick. Simplify the color scheme: To give your home a professionally-decorated touch without the extra effort, focus on simplifying holiday hues. For a time-saving, chic look, use just two or three colors. For example, gold and red or silver and purple are timeless pairings that will transform your party into an elegant affair. Add a magical twinkle: Strings of lights are one of the easiest ways to transform any space into a winter wonderland. Try incorporating strands of mini lights into topiaries and tablescapes for instant holiday allure. Just remember to test lights before using so you don’t end up with burnt-out bulbs or broken strings. Create a premade signature cocktail: By making a big batch of a signature drink ahead of time, you’ll have more free moments for mingling. For example, fill a punch bowl with eggnog or set out pitchers of sangria so guests can grab a tasty libation and toast to a happy new year. The right strategies will help you create a holiday party that will be the talk of the town long after the new year has arrived. What’s more, these tips don’t require excess time, stressful steps or unneeded expenses. And that’s a holiday surprise to welcome with open arms. Please click here to contact an agent to learn more. This entry was posted in Real Estate on November 22, 2016 by Mike.